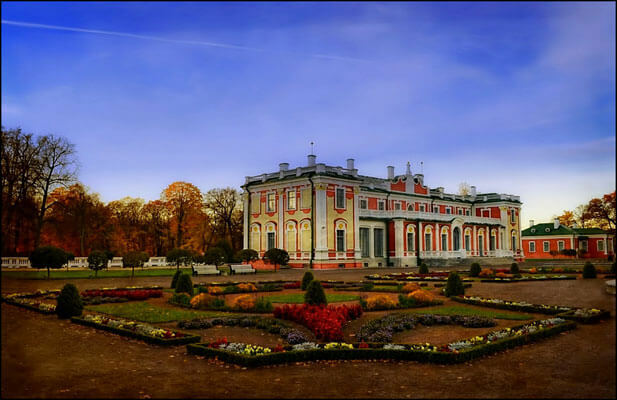 The construction Kadriorg Palace and Park in Estonia began in 1718 under the orders of Russian Tsar Peter the Great. The park has 18th, 19th, and 20th century design elements. Kadriorg Park has become one of the most loved parks in Estonia. It is a perfect place for a stroll, a rest, a date, or a photoshoot. The most popular places for a walk are the flower beds, which surround the Swan Pond, and the promenade, which leads to the president’s palace. Here you can also find a number of popular museums like KUMU (the Estonian Art Museum), Kadriorg Art Museum, and the Mikkeli Museum. You can also see some of the well-known monuments dedicated to famous people: sculptor Amandus Adamson, author F. R. Kreutzwald, and artist Jaan Koort. But the most important and famous place in the park is definitely The Kadriorg Palace! Tsar Peter the Great of Russia decided to buy a small, beautiful Dutch-style manor house for his wife, Catherine. This manor was built after the Great Northern War to Nicola Michetti’s designs. However, the Tsar had plans for a larger palace in the area and so the construction of a new palace began in 1718. Unfortunately, Peter was not blessed with the opportunity to see the Roman Baroque style palace, surrounded by a regular garden, with fountains, hedges and flowerbeds. Peter the Great and his wife visited the unfinished residence a few times before the Tsar’s death. After his death, Catherine did not show any interest in the construction. The palace you can see today is the result of an extreme renovation in 1827. Both the Estonian and the German name for the palace means “Catherine’s valley”.